It’s that time of year again – Christmas shopping has begun. 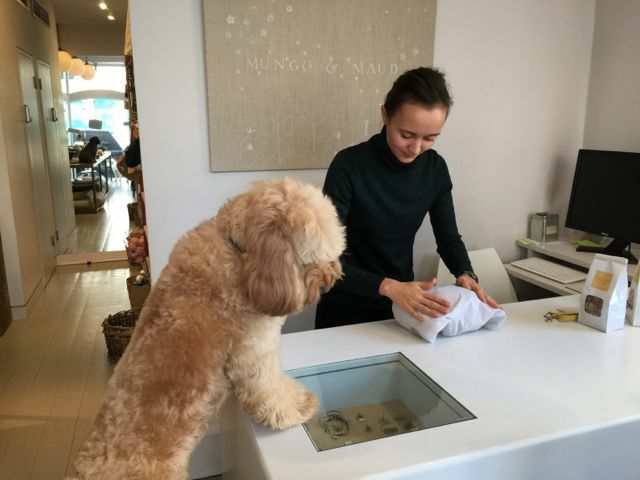 And on the shopping route is our favourite London dog (and cat) accessories store We’re at Mungo & Maud! We’ve been here so many times I know exactly where the treats are – I think the treats are placed way too high on the shelves! The hoomans in here are very clever. 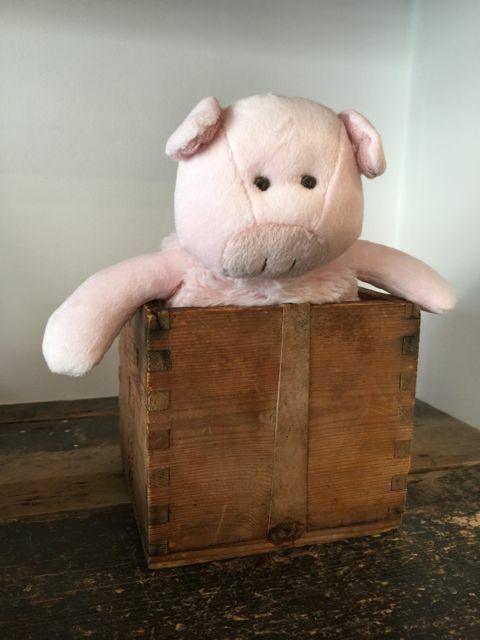 Look at these Puffacake toys – we don’t have those! There’s always something new to discover Oh look! 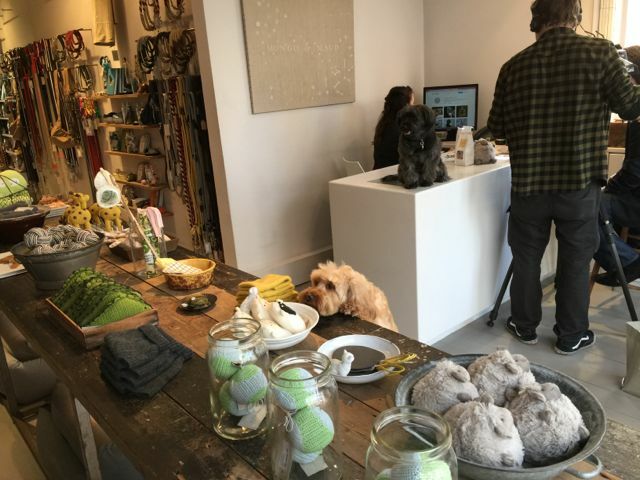 These knitted white sheep dog are new! And what are all these things? Are they for cats? Ahhh yes, George, this is the cat’s corner. 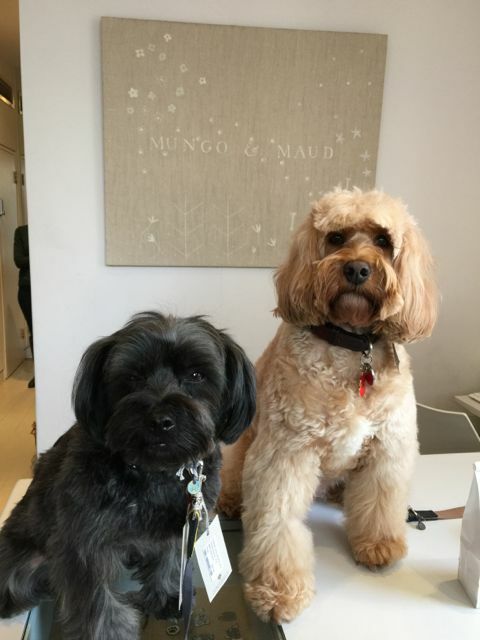 But this is the reason why we’re at Mungo & Maud – we are getting new collars for Christmas Mummy used to buy handbags every year (or season) – now she buys us new collars instead! Either she realised she only has two hands or maybe it’s because her hands always have leads in them instead! Even George is laughing! How many necks do we have? 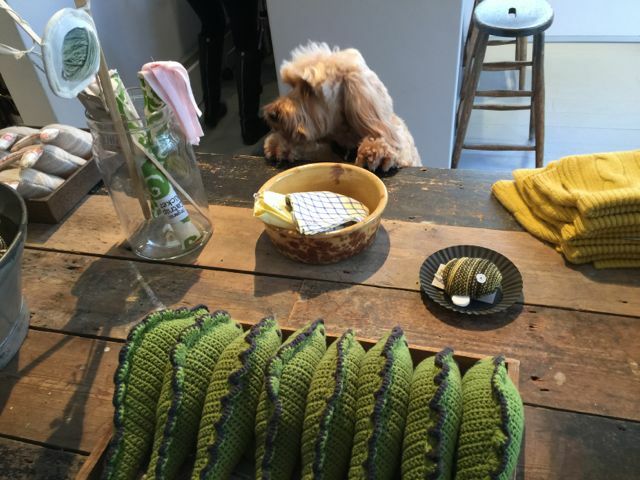 And because this is a pet accessory store, there are always treats for us as I go asking for some. 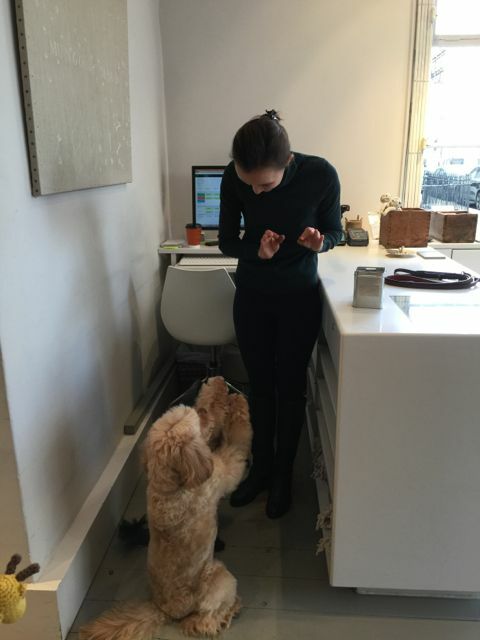 We bought a present for a new puppy, Ted – and asked for it to be gift wrapped. 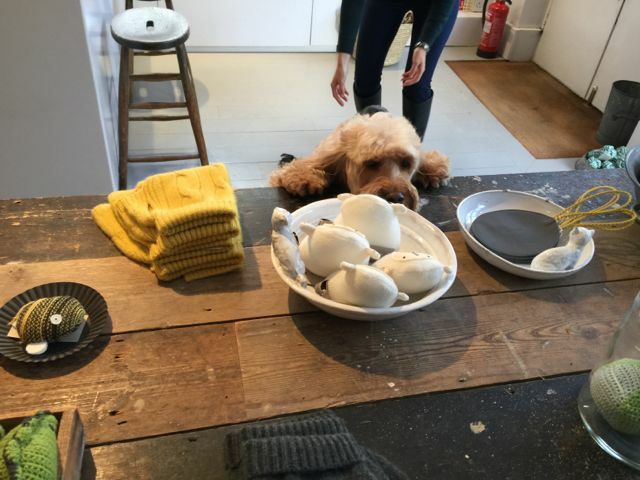 But as I was checking up on the wrapping, someone was filming me! 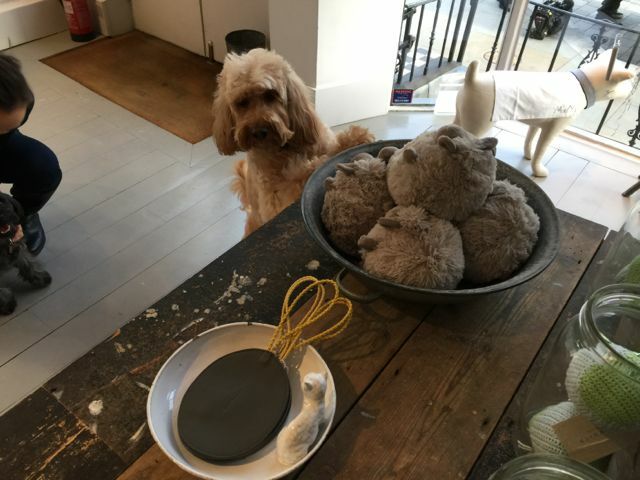 But I was not in the least bothered by the camera – I was really focused on what was on the counter There are treats! 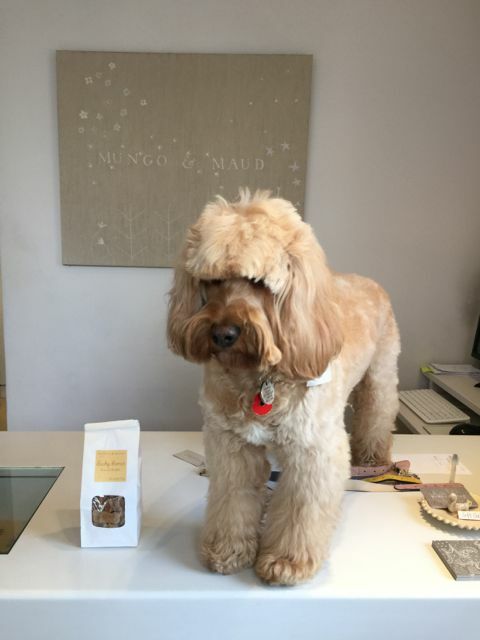 After filming me on the counter, the camera men turned their attention to another person who was talking about the Mungo & Maud dog treats! I was listening very intently to what she had to say and watching even more intently in case some fell from her hands. The people filming us while shopping at Mungo & Maud are from Deutschland! Oh, I told them, both George and I have just come back from there. We love Germany! 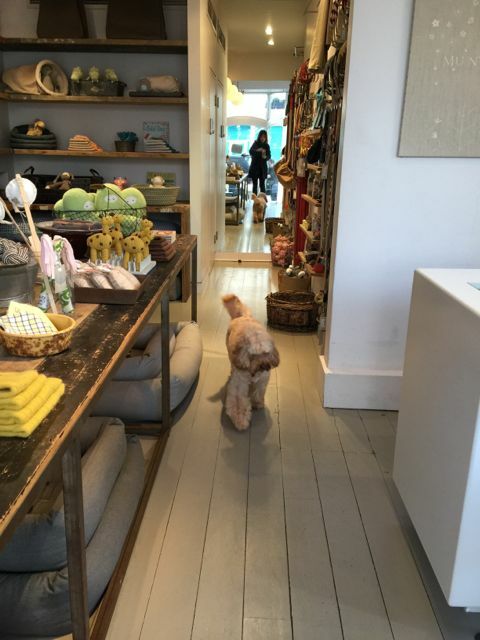 May’s comment: We have started Christmas shopping – and this is our favourite shop. Love their range of toys And always so many interesting things to look at in the shop. 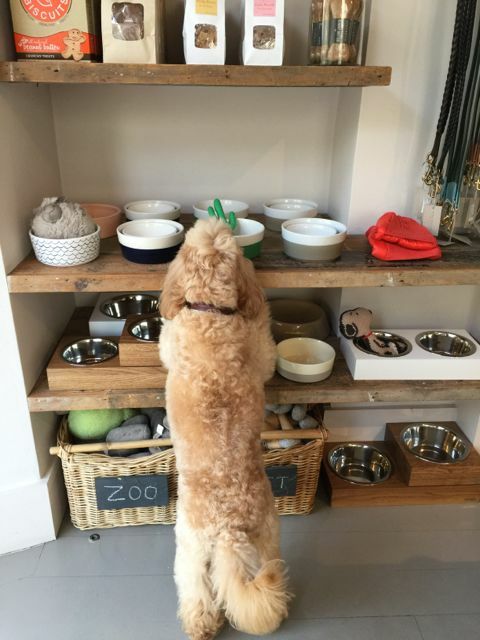 I am always searching for new leads and collars – something different. Over the years I must have bought Darcy at least one new collar and lead each year – partly due to the fact that she used to chew her leads. Instead of buying another leash, it was a good excuse to buy something different each time. We started with webbing in preppy colours (pink and brown, purple and lavender), then muted colours (grey with pink piping and brown with green piping). Then there were African beaded ones – it was too bold and looked very heavy on her. We moved onto calf leather – purple was at first her colour and then it became red. We got rolled leather to avoid matting – in red. Then we found ones that can be personalised with number and/or name on the collars. Red, of course. But as she grew and became more beautiful than cute, and had become quite the sophisticated and aloof lady, preppy and red wasn’t sitting quite right. 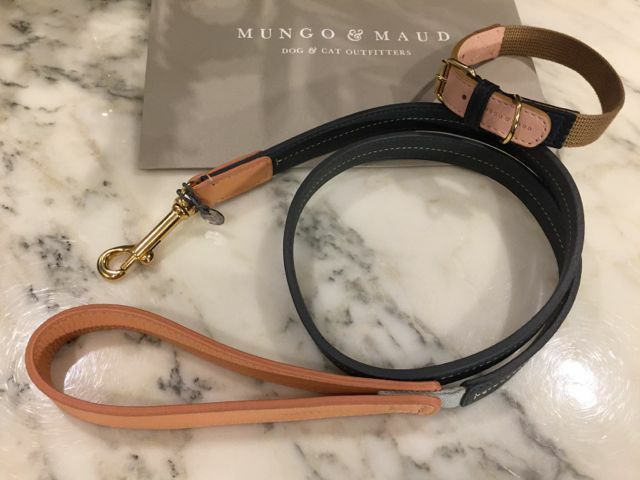 At Mungo and Maud we found the Amalfi Dog Collar in blush and tan. I never had considered tan before but it blended so beautifully with her coat and the hand stitched calf leather in blush made it feminine. 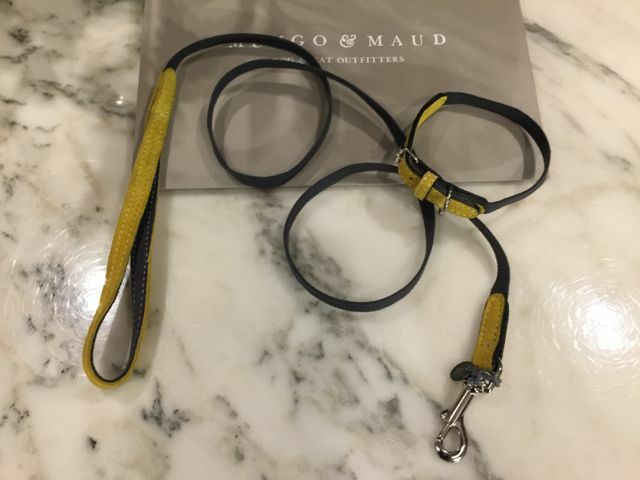 They were out of the Amalfi Dog Lead so got the Bauhaus Dog Lead instead. It still goes but hopefully the matching leash will come before Christmas. And for George, his colour was always blue – navy webbing, then personalised royal blue webbing and then a royal blue leather and a navy leather. 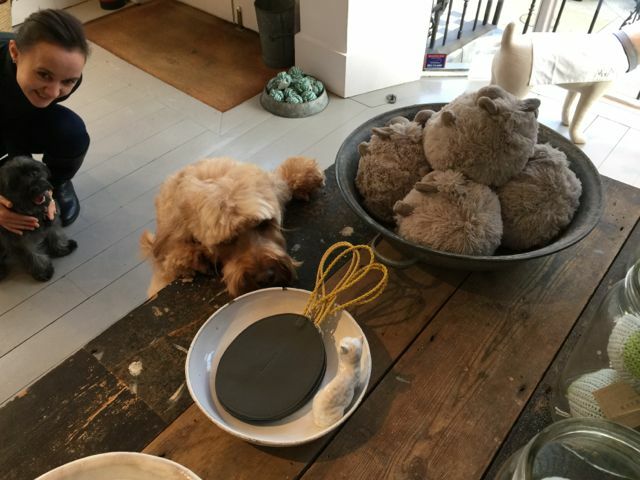 At Mungo & Maud, we found the ultra fine-cotton canvas Baseball Dog Collar in dark grey with dandelion coloured suede trim. It looked so handsome on George. Well, they’re sorted for Christmas. 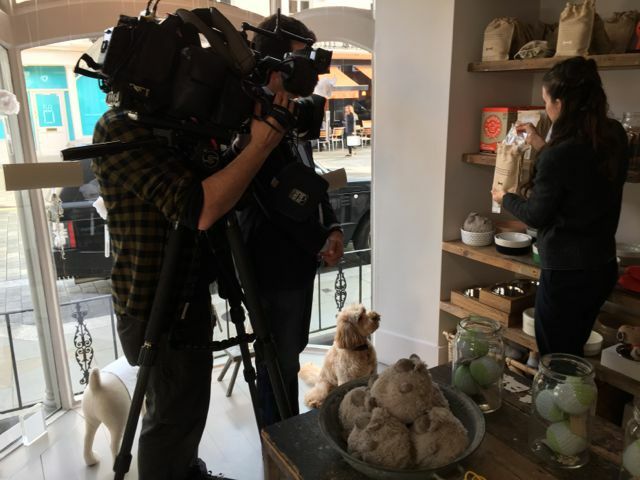 As for the camera crew – we’ll tell you more about that later! What adventures you take your pets (and your readers too) to explore! I love following you around! I love the portrait of George and Darcy, thank you.